Blue Origin plans to offer a 7-meter payload fairing for New Glenn starting with its first launch, skipping a smaller 5.4-meter fairing. ADELAIDE, Australia — Blue Origin announced Sept. 26 that it has signed a deal with a startup satellite operator based in Thailand to launch its first satellite on the New Glenn rocket. Blue Origin President Robert Meyerson announced the deal with mu Space Corporation during a presentation about Blue Origin's activities at the 68th International Astronautical Congress here. "We have entered into an agreement with mu Space on a future launch of a geostationary satellite aboard New Glenn early in the next decade," Meyerson said. "We look forward to launching mu Space to serve the people of Thailand and the Asia-Pacific region." Mu Space is a startup company that looks to use both terrestrial and satellite solutions to meet growing demands for mobile communications in Thailand. The company has not disclosed the details of the satellite that it would launch on New Glenn. "We've decided to go with Blue Origin because we're impressed with the company's vision and engineering approach," said James Yenbamroong, chief executive of mu Space, in a statement. "We want to deliver equitable access to communication services for all and improve quality of life on Earth." Mu Space is the third customer for New Glenn, the large orbital launch vehicle with a reusable first stage that Blue Origin is developing. 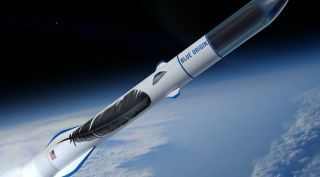 In March, Blue Origin announced Eutelsat as the vehicle's first customer for a future geostationary satellite launch, immediately followed by OneWeb for five launches of satellites for a follow-on low Earth orbit broadband constellation. "The response to New Glenn has been phenomenal," said Meyerson. He reiterated plans announced earlier this month that, based on customer feedback, the company would move directly to a payload fairing 7 meters in diameter, skipping an interim 5.4-meter fairing. New Glenn will be built at a factory outside the gates of the Kennedy Space Center in Florida that is nearly complete, Meyerson said. "In early December — the first week of December — we'll be moving our folks in and starting the integration on the first New Glenn vehicle." Blue Origin has also been busy working on the BE-4 engine, seven of which will power the first stage of New Glenn. The engine is also under consideration by United Launch Alliance for use on its next-generation Vulcan rocket. "BE-4 has also seen measurable progress this year," he said. "We delivered the BE-4 hardware to our West Texas launch site for testing, and have more engines in the pipeline." He did not discuss an engine testing mishap in May that destroyed a set of powerpack hardware used in the BE-4.